There is no compensation plan from any other company that is as easy and lucrative as the Million Dollar Matrix. 50% of the product purchase is paid out in the 3 wide by 6 level deep matrix. The other 50% is paid in Matching Bonuses and exciting Coded Infinity commissions. There are no limits to how much you can earn and the matrix alone can pay out over $1.6 million with no recruiting requirements! Yes, that's a 100% pay out paid instantly into your company bitcoin wallet! After your initial one-time purchase for $30 worth of BitCoin, there are 3 more one-time purchases in the amounts $100, $1000, and $10,000. These three additional purchases are funded automatically by your commission proceeds only. Our goal is to put more money into the pockets of our members than any other company. 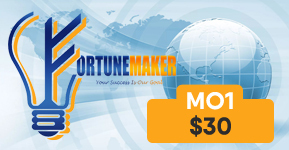 Our $30 Accelerator will quickly rocket you into the 6 level matrix money machine! Don't Delay Get Started Today! Check out the pay plan details below ... see what happens if you sponsor 3 people and help them do the same. ... And that does not even include the Infinity Bonuses (see below)! Sponsor 4 or more and you will become eligible to begin earning Infinity Bonuses to unlimited depth and increase your income potential enormously while also helping your fellow team members even further (spill)! It's a Win/Win for everyone! they happened to fall on your 1st level. Their 6th level is your 7th. They earn 15% on their 6th level and you earn a 50% match of their commission. The initial $30 purchase is payable only 3 levels up. It pays no Matching Bonus or Coded Infinity commission. 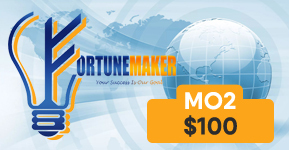 To qualify for the 6 level commissions on MO2, make an upgrade purchase with a one-time $100 from commissions earned. AND initiate a $20 monthly admin fee. Matrix commissions are paid to each of six qualified people above the transaction in the matrix (compresses above unqualified members). $2 first level, $3 second level, $10 on levels 3, 4, and 5; $15 sixth level. It also pays $25 Coded Infinity commission to qualified members. To qualify for the 6 level commissions on MO3, make an upgrade purchase with a one-time $1000 from commissions earned. $20 first level, $30 second level, $100 on levels 3, 4, and 5; $150 sixth level. It also pays $250 Coded Infinity commission to qualified members. To qualify for the 6 level commissions on MO4, make an upgrade purchase with a one-time $10,000 from commissions earned. $200 first level, $300 second level, $1000 on levels 3, 4, and 5; $1500 sixth level. It also pays $2500 Coded Infinity commission to qualified members. Every $100 MO2 buyer you sponsor after your 3rd one will have your member ID coded to them. 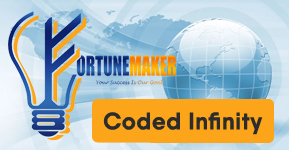 You will be their coded upline. They will pass on your member ID to the first 3 MO2 buyers they sponsor. Those people will pass your member ID to the first 3 MO2 buyers they recruit. This happens infinitely deep. You are the coded upline on everyone's first 3. After sponsoring 3, they then begin to create their own coded infinity group. You will be paid 25% on all MO2, MO3 and MO4 purchases made by anyone coded to you. Commissions will be paid into your company Wallet. Upgrades to MO2, MO3 and MO4 purchases will be made automatically the moment your cumulative commission balance reaches $120, $1000, and $10,000 respectively. Withdrawals from your FortuneMaker commissions will not be allowed until the $100 MO2 Upgrade Purchase is made. Then withdrawal of 20% of all commissions will be available until your $1,000 MO3 purchase is made. Then withdrawal of 50% of all commissions will be available until your $10,000 MO4 purchase is made. Then all commissions are 100% available for withdrawal. * If, after 120 days in the program, you do not yet have enough commissions to automatically upgrade to the $100 MO2 product, 100% of your commissions will be available for withdrawal. * If, after 300 days in the program, you do not yet have enough commissions to automatically upgrade to the $10,000 MO4 product, 100% of your commissions will be available for withdrawal.